Within just a few minutes of entering the Nature Morte gallery space in Berlin, one is met with strange burning smell. “We had a fire ritual in the gallery this morning,” explains artist AA Bronson, and suddenly things begin to make a bit more sense. Together with Michael Bühler-Rose, he has created an exhibition that engages with the ideas of ritual, the artist as a shaman and the often difficult link between spirituality and artistic practice. The works themselves embody these themes and manifest themselves in a variety of mediums. AA Bronson’s living plants sit in the gallery window, a direct reference to a Botanica – a supply store for magical rituals, from which the exhibition takes its name. In another room, Michael Bühler-Rose’s series of flame photographs draw on the idea of the aura on the art object, and of course flame rituals. During Gallery Weekend Berlin, we spoke to both artists about the new exhibition and their spiritual vision of the contemporary gallery space. The original idea was to do a collaboration in the form of a Botanica. In America, a Botanica is something that usually pretends to be like a little corner store, but once you’re inside you realise you are actually in a supply store for magical rituals. At the front they sell scented candles, then you go a bit further back into the store and there’s all the incense and the herbs. They usually have a back room where rituals actually take place. It is really for all of the Afro-Caribbean religions like Santeria and Voodoo, which were a means through which the slaves, when they came to the Americas, were able to pretend to practise Christianity, whilst actually practising their African religions. So the theme of the show was based on the supply stores for witches in a way. So, we were going to do our own Botanica. However, with Michael in New York and me in Berlin it became too complicated. So, instead we chose Botanica as the theme and the works tangentially relate to that. Themes of religion, spirituality and ritual. In photographs, videos, and installations, Michael Bühler-Rose explores ideas about ritual, image worship, and the metamorphosis and transcendence experienced through religious practices and art objects. Since the age of 14, Bühler-Rose has been studying Sanskrit and practicing Vaishnavism—a branch of Hinduism dedicated to the god Vishnu—and has spent extended periods of time in India. In the artist’s own words, he draws “parallels between the artist as priest, art object as a deity, the gallery as a post-Enlightenment temple and the installation of the artwork as a ritual.” For Removing the Evil Eye (2010), Bühler-Rose photographed a turmeric-dusted coconut with a flame burning at its top, suggesting the material components of a ceremony or sacrament. 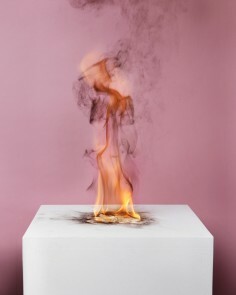 Camphor Flames is a project by Michael Bühler-Rose. Born 1980 in New Brunswick, New Jersey. He studied at University of Florida and School of the Museum of Fine Arts Boston. He currently lives and works in New York. Michael Bühler-Rose’s practices on multiple platforms influence his production as an artist. He has described his subjects as “theatrical cultural realities” and “feats of representation through place and displacement.” Bühler-Rose uses western painting styles: still lifes, landscapes, portraits, to play with previous political notions of Hindu and Indic aesthetics: representations of gods and goddesses, incense, flowers, or the saris or bharatnaytam outfits worn by young women of European descent who live in a Hindu community in Florida. These pictures create a dialogue between the Orient and the Occident, creating a game of mirrors and reflections that interact endlessly, creating a juxtaposition of territories. Michael Bühler-Rose, born in New Jersey, lives and works in New York City. He received a Fulbright Fellowship to India, obtained his BFA from the School of the Museum of Fine Arts, Boston and MFA from University of Florida. Recent work and curated projects have been exhibited at the Museum of Fine Arts, Boston; Indira Gandhi National Centre for the Arts, Delhi; Vogt Gallery, New York; Chatterjee and Lal, Mumbai; Nature Morte, New Delhi; and Carroll and Sons, Boston. His work is held in the Sammlung Goetz, Munich, the Die Photographische Sammlung, Cologne, and the Harvard Fogg Museum.